People always want to touch my paintings. The bumps, cracks, and mortar joints look very three dimensional. Viewers invariably put their heads against the wall next to the painting, trying to to determine if there is actual texture. I always promised to do a painting to encourage people to touch it. This concept worked perfectly for my Envy series, because people never feel compelled to reach out and stroke a wall, to enjoy the texture under one's finger tips. I could easily imagine a cinder block wall longing to be touched. 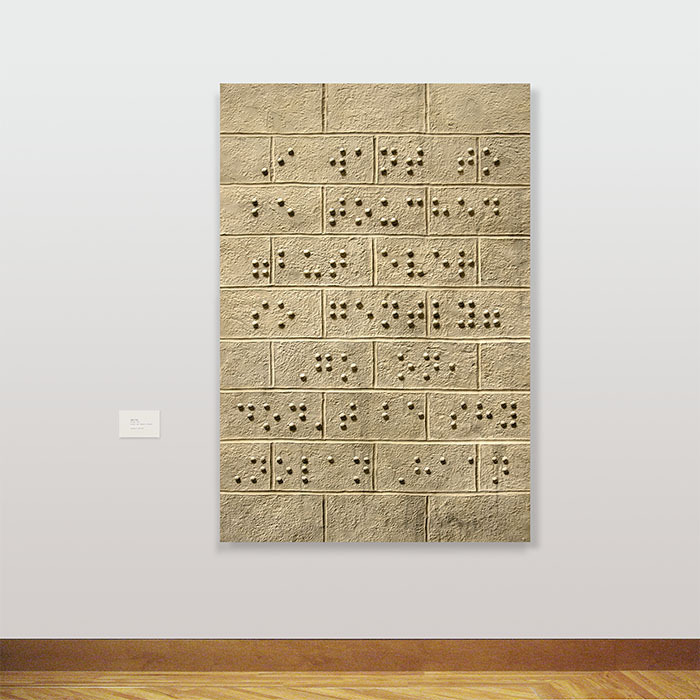 I decided to encourage the public to touch this painting, and braille seemed the logical language to use. 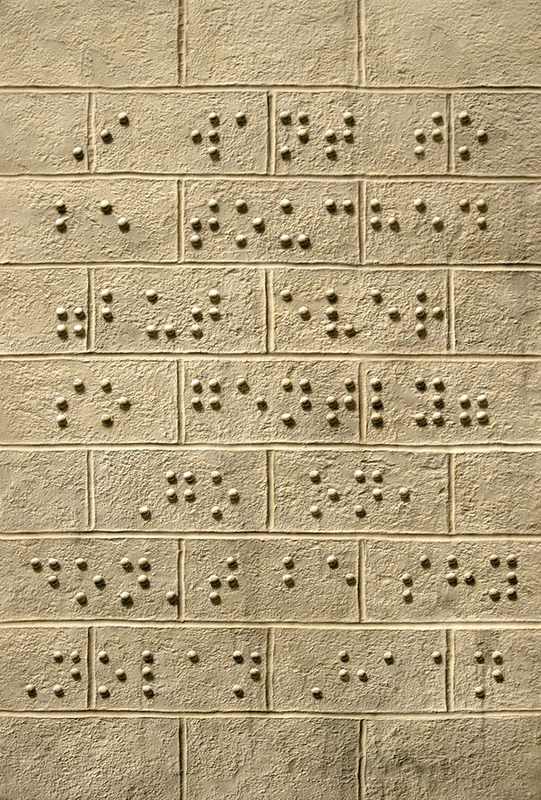 The translation of the braille is: "I want to be touched, (but ever so gently.) Go on, don't be shy." 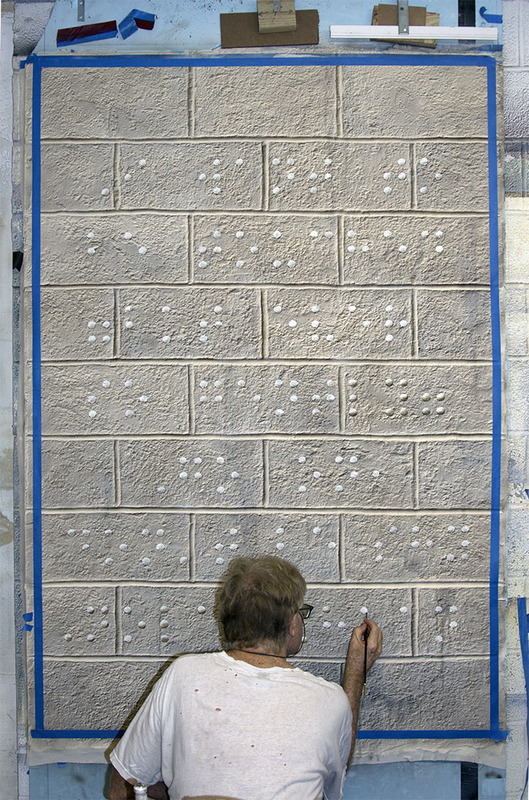 Unfortunately, after spending a couple months painting 27 concrete blocks and 175 braille balls, I didn't want anyone to touch it! Even if my paintings are not a good fit for you, I hope something on this website touched you and gave you something you can incorporate into your life. Please bookmark and return often. Much love. I always promised to do a painting to encourage people to touch it. This concept worked perfectly for my Envy series, because people never feel compelled to reach out and stroke a wall, to enjoy the texture under one's finger tips. I could easily imagine a cinder block wall longing to be touched. 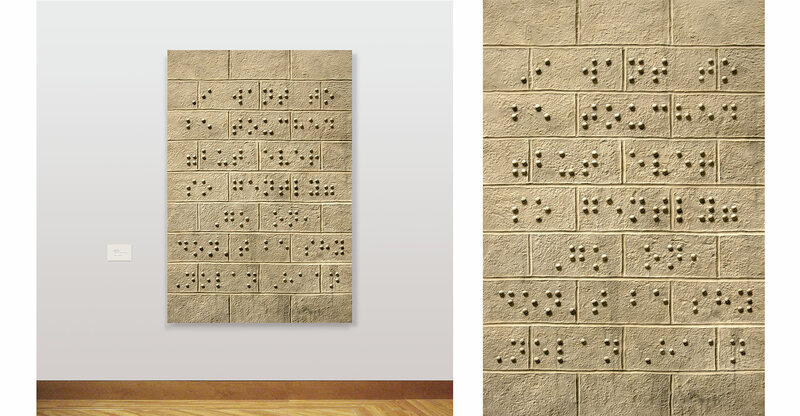 I decided to encourage the public to touch this painting, and braille seemed the logical language to use. The translation of the braille is: "I want to be touched, (but ever so gently.) Go on, don't be shy." Unfortunately, after spending a couple months painting 27 concrete blocks and 175 braille balls, I didn't want anyone to touch it!